Mr. Fred Rogers told a story several times throughout his life that many people have been repeating lately: “When I was a boy and I would see scary things in the news, my mother would say to me, ‘Look for the helpers. You will always find people who are helping.’” It certainly looks scary out there right now, and the bonds of community and neighborliness can seem more unstable than ever. But at the public library, the helpers can be found everywhere you turn, and I’m not just talking about the librarians. I’m talking about the people who volunteer their time, support their library with their voice and vote, and help the library respond to community needs. The people who donate time, money, and materials to help others. People of all ages and backgrounds. People just like you. Don’t believe me? Let me show you some of the ways Jefferson and Waukesha County libraries and their patrons have used library space and services to aid their communities this year. Many libraries collect food for local food pantries through a popular program called Food for Fines. Alice Baker Library in Eagle, New Berlin Public Library, and Waukesha Public Library have all offered this program in recent months. At the Waukesha Public Library, people donated over 1,168 pounds of food for the Food Pantry of Waukesha County in October; in response, the library waived $4,002 in fines. Those who need a little extra food on their tables can find items like these at the Irvin L. Young Memorial Library’s Little Free Pantry in Whitewater. Every holiday, the Karl Junginger Memorial Library and the people of Waterloo address the needs of local senior citizens with a Giving Tree at the library. Ornaments on the tree list various items needed; everyone is invited to come and select an ornament from the tree, and then drop the item back off at the library. With cold weather coming, the Muskego Public Library participated in PBS’s Mittens and More drive, and library patrons donated 50 mittens, hats, and scarves for residents of southeastern Wisconsin. They didn’t forget furry friends as well; this spring, the Library’s crochet group created fleece blankets for pets at the Milwaukee HAWS animal shelter. This October, the Jefferson Public Library collected socks during the Wizards & Warriors Festival. Community members and festival attendees donated 349 pairs of socks, which the library distributed between three Jefferson County charities: the Jefferson County Human Services Foster Care Program, People Against Domestic & Sexual Abuse, and Christmas Neighbors of Jefferson County. From April through September, Menomonee Falls Public Library served as a collection point for a local Click for Babies campaign, which spreads awareness of infant abuse and shaken baby syndrome by providing parents with handmade hats and information on infant crying. Library patrons, as well as area knitting and crochet groups, created and donated hats and yarn for the program. This year, the library collected 558 hats from the community; a Click for Babies Campaign Coordinator for Wisconsin commented that it was the largest collection of hats ever gathered from one site. 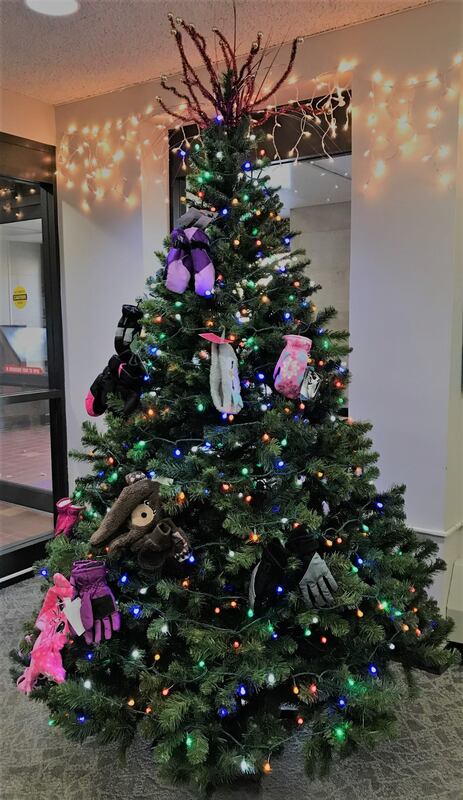 For Christmas, the Watertown Public Library has hosted a Mitten Tree for the past six years, asking patrons to “decorate” it with new mittens, scarves, and hats. The library gives all items to the Watertown Family Aid for their annual gift event for children. The library has discovered that many patrons are also generous with their time- many donations are hand-knit! All public libraries are invested in the growth and success of their communities, and committed to addressing residents’ needs, but the people who come in our doors are the ones that help us make that difference as they demonstrate the power of community to heal and strengthen others. It is truly a community effort, one that reaches far beyond the walls of the library. As the holidays approach, I encourage you to look for the helpers around you and consider finding ways you can serve your community at your local library. It is imperative that we not only find the helpers, but strive to be the helpers as well. When we do, we discover that small actions can lead to positive change. After all, at the library, we are all one another’s neighbor. Written by Jill Fuller. A version of this article appeared in the Waukesha Freeman, the Oconomowoc Enterprise, the Daily Jefferson County Union, the Waterloo Courier, and the Watertown Times. We will be sharing those pieces here on our website a few weeks after each piece has been printed.